（Kyodo Apr 5, 2016）　The Tokyo 2020 Olympics organizing committee has requested that historic Jingu Stadium be closed for half a year starting in May 2020, an amateur baseball source said Tuesday. The ballpark is a short distance from the Tokyo’s yet-to-be-constructed National Stadium. 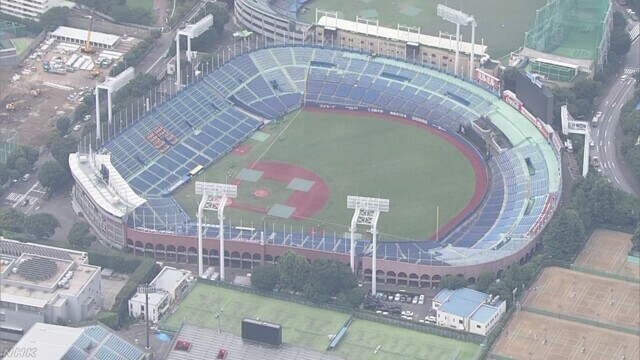 Jingu, built in 1926, is the home to the Central League’s Tokyo Yakult Swallows as well as the prestigious Tokyo Six University and Tokyo Metropolitan university leagues and the Tokyo Metropolitan High School Baseball tournament. “Security measures, such as stopping traffic in the streets surrounding the new National Stadium are essential, as is reserving space to store equipment,” a member of the 2020 organizing committee said. If things go as 2020 organizers hope, the huge schedule of baseball games Jingu Stadium hosts from May through October will need to reserve alternate venues. The park is scheduled to be replaced in 2022, following the completion of a new facility. A similar fate will also befall neighboring Prince Chichibu Memorial Rugby Ground, which is slated to be demolished prior to the 2020 Games to serve as parking for the Olympics.